Japanese gamers and manga aficionados and every combination thereof will get a treat this summer with the release of a NES Classic Edition loaded with games from the pages of Weekly Jump. The beloved manga mag is celebrating its 50th anniversary and this solid gold Famicom is part of the festivities. 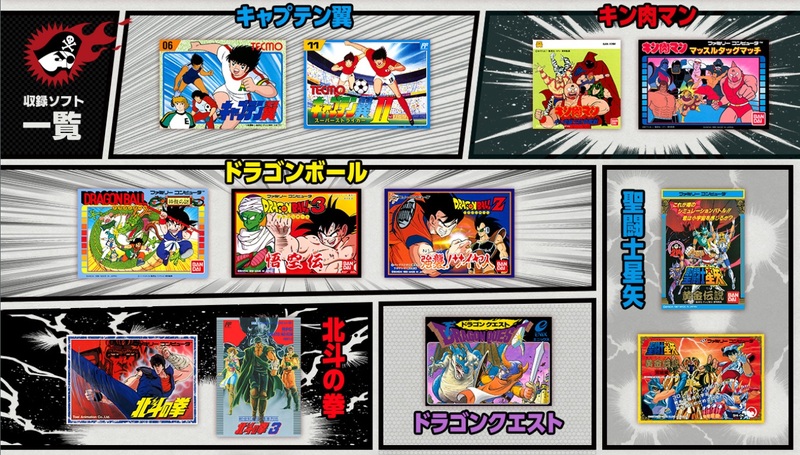 There’s basically no chance this Jump-themed NES will get a release in the US — first because hardly any Americans will have read any of these manga (with a couple exceptions) and second because even fewer will have played the Famicom games associated with them. That said, this nurtures the hope inside me that we will at some point see other themed NES Classics; the original has, of course, a fantastic collection — but there are dozens more games I would have loved to see on there. You can hack the thing pretty easily and put half the entire NES library on it, but Nintendo’s official versions will have been tested and perhaps even tweaked to make sure they run perfectly (though admittedly emulation problems aren’t common for NES games). More importantly it’s possible these hypothetical themed consoles may come with new accessories that I desperately need, like a NES Advantage, Zapper (not sure how it would work), or NES Max. Perhaps even a Power Glove? In the meantime, at least if you missed the chance to buy one the first time around, you can grab one come the end of June.